It has been six weeks since the new school term started. Things are shaping up on both the home front and workplace. After trying out various to-do-list strategies and prioritising the items on my schedule. I have come up of a more efficient way of getting my daily chores, task done. It has been my biggest time waster and energy sapper. Through trial and error I have learned the importance of having a to-do-list and being flexible at the same time. 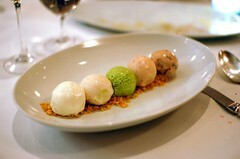 Like the 5 different flavours of ice-cream in the plate above. How things line up and how they are reflected in our eyes depends on the strategies and approaches we take each day. To constantly fret and do nothing will not reduce the growing mountain of clothes on the sofa or the piles of papers on my work desk which has to be marked. Setting a list of 5-10 things to do per day. Working off the list based on the amount of energy I have for doing each task at that particular time of the day. Spending 5-10 minutes in between task to rest/zone off/ indulge in Facebook Games. I have learned not too be too strict with myself about completing everything on the list. If I do get 60% to 70% done is good enough. Sometimes it is just impossible to complete everything that one sets out to do. You will just have to try to make up for it the next day or so. Today I tackled the following this afternoon. What have you tackled today? I love your approach. I think setting a 60-70% goal is a good way to feel accomplished and not stressed about getting everything done. .-= Toddler Crafts Onna´s last blog ..PreSchool Crafts – Mask Fun for Kids! =-.